Educational Testing provides support for those undertaking training in, and for training providers of, the Certificate of Competence in Educational Testing (CCET) (Level A). Developed by the British Psychological Society (BPS) the CCET aims to meet a need for standards for the use of tests in education in the UK, to encourage responsible test use by psychologists and non-psychologists alike. Appendices offer guidance on BPS Standards, a glossary of technical terms, useful web-sites and on-line resources and Test Publishers Addresses. James Boyle is Reader in Educational Psychology at the University of Strathclyde, and is chair of the group that put together the CCET. Stephen Fisher is Senior Lecturer in Occupational Psychology at the University of Strathclyde. Part I: From Dualism to Common-sense Functionalism. 1. The Flight from Dualism. The Issue Between Dualism and Materialism. The Path to Functionalism via a Causal Theory. The Causal Theory of Mind. Behaviour Characterized in Terms of Environmental Impact. What Does Common Sense Say about the Mind?. Part II: Rivals and Objections. The Description Theory of Reference. Common-sense Functional Roles as a Reference-fixing Device. The Identity Theory and Functionalism. Some Early Objections to the Identity Theory. Token–Token versus Type–Type Identity Theories. 7. Four Challenges to Functionalism. 8. Phenomenal Qualities and Consciousness. 10. The Language of Thought. The Language of Thought Hypothesis. What is the Problem of Content?. Problems for the Map-system Theory. Problems and Questions for the Internal Sentence Theory. Connectionism and the Map-system Theory. 13. Broad and Narrow Content. Deflationism about Broad Content versus Scepticism about Narrow Content. Part IV: Explaining Behaviour: Eliminativism and Realism. The Functionalist Reply to Eliminativism. Natural Kinds and Scientific Reductions. 15. Psychological Explanation and Common-sense Functionalism. Three Questions for Common-sense Functionalism. 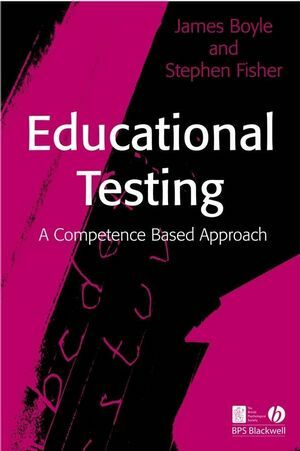 "James Boyle and Stephen Fisher have done an excellent job in providing a single text for those seeking the BPS's Certificate of Competence in Educational Testing (Level A). In addition to covering the knowledge requirements for the qualification, the book also reprints the full BPS information pack relating to the qualification (Appendix 1) and includes information about how competence is assessed (Appendix 2). These are very useful additions for those undergoing training as they provide them with a clear view of what they will be expected to know and do if they are to be regarded as competent and how that knowledge and skills will be assessed . The book contains a number of other useful appendices. In short, this provides not only an accessible and comprehensive source text for the Certificate, but also a useful reference set of materials. " Dave Bartram, Chair of the BPS Steering Committee on Test Standards. Includes appendices to: offer guidance on BPS Standards, a glossary of technical terms, useful web-sites and on-line resources and Test Publishers Addresses.